The sun lights this scene from the left. Jesus, sitting, holding a baby in his arms, with children by him & on his lap. Simon/Peter & his brother Andrew standing on the left. 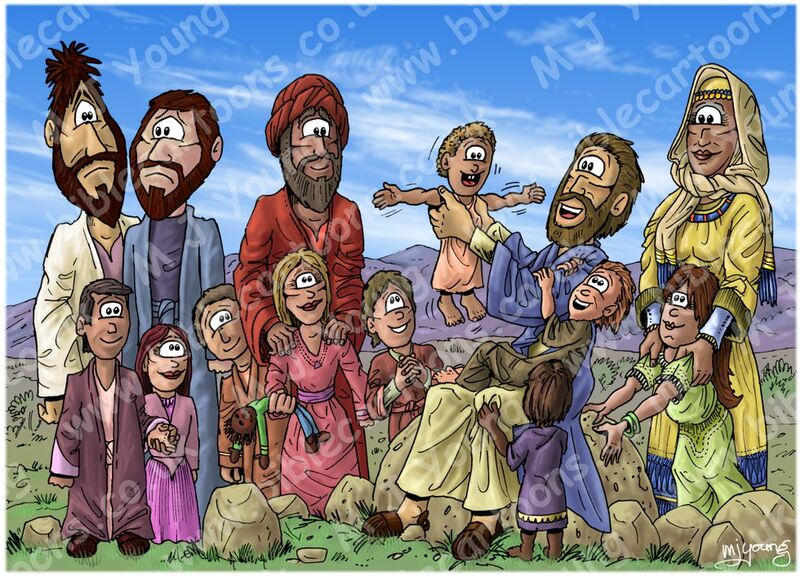 They represent all of the disciples in this scene, & have looks of disquiet or dismay, having been rebuked by Jesus for trying to stop the children getting to him. The man in red & the woman in yellow represent all the parents, with children looking up at Jesus & interacting with him. I drew & coloured up this scene before the previous scene. In Scene 01 we see that Jesus is indignant that his disciples have taken it upon themselves to prevent people (especially children) from coming into his presence. 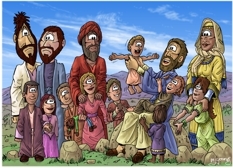 In this scene we see the children with Jesus, parents looking on with smiles. Note Simon/Peter & his brother Andrew (representing all Jesus’ disciples) looking sombre & reprimanded, on the left of the scene.